This incredible "Doubles" recipe from Trinidad and Tobago made it to my top 5 favorite meals of all the dishes I've cooked so far since I started this project in April 2010. Partly because it's unique, delicious and captures the smells and flavors of this beautiful West Indian country, but also, because of the generosity of friends who helped make it possible. Props to: Gary Ottley, photographer extraordinaire (check out his site if you want to be inspired) for taking time out of his busy schedule to share favorite dishes from his country of origin; to Eric Ackerson, whose My Hungry Tum professional, international food blog (started way before mine and should be a book) for sharing his tamarind hot sauce recipe; to Ben, my husband's best friend my foodie soul-mate, for snagging a bag of tamarind, delivering it to my house and showing me how to peel (and eat) it; to my Facebook friends who passed on leads to various stores and food sources; and, last but never least, to my awesome husband and sons for always supporting my on-going journey. It's a diverse and spicy world we live in, and all of you make it that much sweeter - much love. 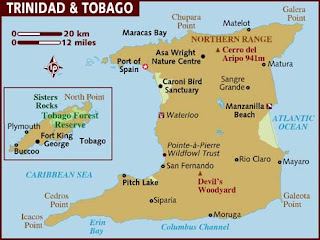 An archipelagic state in the southern Caribbean, Trinidad and Tobago (2 islands) is on the coast of northeastern Venezuela and south of Grenada in the Lesser Antilles. The country shares maritime borders with Barbados, Guyana and Venezuela. In 1498 Columbus landed on and named Trinidad. A century later, the Spaniards settled the island, and wiped out the the indigenous Arawak and Carib Indians, keeping rule of the Island until the British captured it in 1797. During Colonial rule, sugar and cocoa plantations were the primary source of revenue. Subsequently, however, the island changed hands 22 times, more than any other West Indian islands. In 1803, Britain took Tobago and by 1888, both Trinidad and Tobago were incorporated into a single colony. The country finally gained independence in 1962 and became a republic in 1876. The majority of the population are of African and East Indian descent, with others including Hindi, French, Patois, Creole and East Indian. Cuisine in Trinidad and Tobago has it's roots in Spanish, French, British, Amerindian, African, Indian, Chinese, Middle Eastern and Portuguese traditions. Therefore, traditional African stews, one-pot dishes, pelau, macaroni pie, plantain, callaloo and chicken and red beans are all part of the interesting and rich cuisine enjoyed on the islands. Creole traditions include oxtail soup, beef soup and cowheel soup. Curries and fish dishes of all kinds are popular, including two of my favorites, curried goat and duck. Loved by all (even here in the U.S.) is roti and the unofficial national breakfast, "Doubles", so named because 2 pieces of barra (bread) are always served with the chickpea filling and chutney. Still other foods that can be found include: bake and shark, pepper sauce, fruit chows, souse, chip-chip, conch and wild meat. Lastly, all kinds of tropical fruits such as coconut, mango, pineapple and papaya (to name but a few), round out this country's wonderful offerings. Put 1 cup of lukewarm water in a small bowl, add sugar and sprinkle with yeast. Then leave mixture until it swells to twice its size. Combine flour, salt, saffron and geera in a large bowl. Add yeast to flour mixture along with 1¼ cups of water and mix into slightly firm dough. Mix well but try to handle dough as little as possible, cover and let it rise to double its size, then form dough into 36 small balls and then let rise for another 10 to 15 minutes. Take a ball of the barra dough and pat into a flattened 4-inch circle with both hands. If the dough sticks to your hands dampen hands with water. Fry immediately after shaping in hot oil, turning once. Drain on paper towels and allow to cool to room temperature. Dice onion, garlic and chive, keeping each separate. Put oil in a pot along with finely chopped onion and saute on medium heat until onion begins to caramelize. Add enough water to cover channa by about 1½ inches, and then boil channa until it's very soft. Depending on the type of pot you use, and how often you remove the lid to stir, you may need to add water during this process. When you are finished cooking there must be some liquid left in pot, don't let it dry out. Julienne ¾ of cucumber into relatively small pieces. Cucumber seed and skin can be removed if you choose. We leave about a ¼ of skin to add color to chutney. Grate remainder of cucumber and add to mixture, which adds moisture to chutney. Finely dice garlic, cilantro and chives and add to mix. Finely dice pepper without touching it if possible, you don't want to inadvertently get this pepper in, or near, your eye. Gradually add the diced pepper to mix until it is spicy enough for your taste. Optionally, you may leave out some, or all, of the pepper, and use a tasty Caribbean pepper sauce to add the level of spice you desire when preparing individual Doubles. Whirl that food processor till everything has reached a nice consistency and then allow 1/2 hour for the flavors to meld. With all the elements prepared, it is now time for the last step in the assembly of your Trinidad Doubles recipe. On a plate, place 2 barra side-by-side but overlapping slightly. Now, add a tablespoonful of channa and a liberal garnish of cucumber chutney, then finally, a drizzle of Trinidad pepper sauce to create the level of spiciness you desire. Enjoy. looks gorgeous, hon - and so different ! Love it ! Isn't it amazing how connected the world is. Many Indians too refer to chickpea as channa. Love your post and photos. Sorry, I haven't been in touch lately. Hope things are going well with you and yours. That's by far the best photo of doubles I've ever seen! Barra looks amazing and fluffy! Nothing like the dry chappatis we get. I love Vietnamese food - for that matter, anything with lime! How lucky you are to have chilies, and all those lovely herbs blooming now. We have snow on the ground :) Thanks, as always, for stopping in!